Sara entered this one in the Prime Pork recipe contest. I changed it a little. It's pretty fab. 1Cut the pork tenderloin in half crosswise and then lengthwise into strips. Put in a bowl with all the marinade ingredients, and toss it around with your hands. Cover and refrigerate for an hour or overnight. 2Mix together all the satay sauce ingredients, and thin with additional water if necessary. Set aside. 3Preheat a grill or broiler. 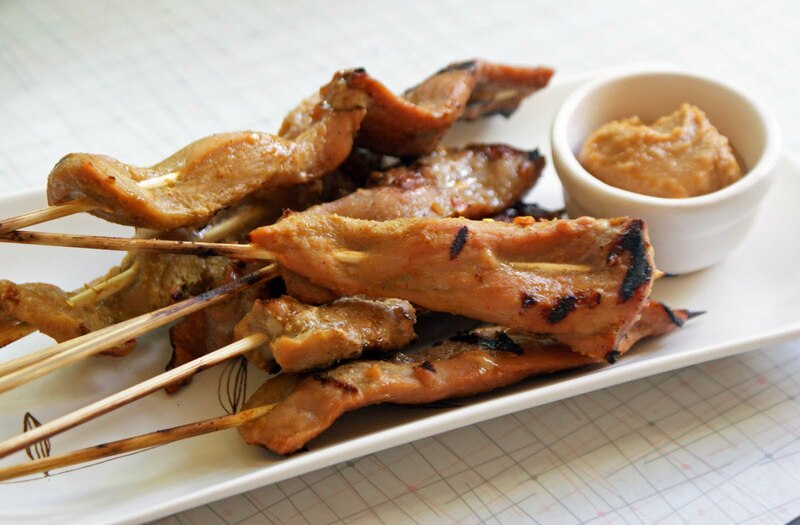 Thread the pork onto skewers that have been soaked in water for at least 10 minutes. Grill or broil on both sides until just cooked through. 4 Serve skewers on top of coconut rice with satay sauce on the side.